Image by Gilgongo. Some Rights Reserved. 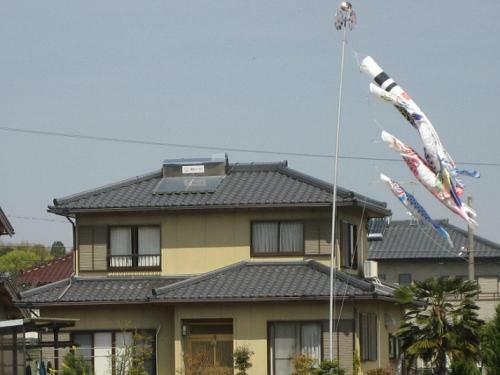 Tokyo Metropolitan Government (TMG) decided to initiate efforts for expanding the use of solar heat from fiscal 2009 by introducing the Green Heat Certification System and by granting subsidies to households for installing solar thermal equipment for the two-year period beginning in April 2009. According to the plans for these measures: (1) the Tokyo Environmental Public Service Corp. (TEPSC) will grant subsidies to households for the environmental value (green heat equivalent) resulting from the introduction of photovoltaic power generators, and solar-powered water and room heaters, on the condition that the environmental value be transferred to TEPSC for 10 years; (2) the TMG will apply for certification of the transferred environmental value for its certification organization, Green Energy Certification Center (the calculation method is currently under consideration by the center); and (3) TEPSC sells the transferred environmental value to companies, etc., through the certification system. The TMG aims to introduce the equivalent of 1,000,000 kilowatts of solar energy into Tokyo by 2016 for the expansion of renewable energy use. Initially, the TMG aims to install equipment using solar energy in 40,000 households within two years from fiscal 2009. The TMG enacted an ordinance requiring large-scale businesses to reduce CO2 emissions in June 2008. The new system is expected to help businesses make up shortfalls in their reduction targets. The TMG intends to increase its efforts to devise mechanisms for both households and businesses to fight global warming.